An interview with elite coach Ron Ludington, himself an Olympic medalist, coach of too many incredible skaters to mention, and head of Delaware’s incredible skating program. 56 minutes, 13 seconds. On his most embarrassing skating moment: Oh, I don’t think I have any trouble telling you when that was. This goes back when I think we had won the national pair championship, Nancy and myself, probably three times, and our last year was the Olympic year, leading into it. And we were the stars of a show in New York City called Superskates. And what it was, was a speedskating competition but they had exhibitions, and we were the stars of the exhibition and they were publicizing us in New York City. And so, you know, I had a lot of roller skating friends that came out of that area. And so we went down to rehearse the show, and we had given our music in to the conductor of the orchestra. And he was doing all the transcribing so that the orchestra could play the music. So we had a rehearsal and he was obviously in a hurry, and I didn’t like the speed of the music that he was playing. So I said that we need this slower, and we got into, not an argument but a very hot discussion about how we needed it at a certain tempo. So anyway, push comes to shove and we end the whole Superskates show with our performance. All my roller skating friends are there to watch me, the roller skater, on ice. So we go out, and then they start playing the music too fast. And I got so mad that I lost my focus and forgot my steps. And Nancy went the right direction, she was okay, while I’m wandering around like a lost soul. Finally I come back, but it was just a mess. And I had to face all of them later, in the locker room, and it wasn’t a very happy scene as far as I was concerned. That stuck right out because it didn’t take me two seconds to remember it [laughs]. On his roller skating career: I competed up until about [age] 17 in rollers, and then decided I I’d like to move on into a sport that will take me to the Olympics. And I had a good friend named Charlie Wahlig, who was from this area. Well, Charlie was a dancing champion in roller skating, and also a speed skating champion. So he was a very famous roller skater. So I said to Charlie, we used to hang around together, I said, Charlie, I just want you to know, I’m going to go and become an ice skater and become rich and famous. So many many years go by, and here we both end up in Newark. And they had this thing down in Dover, they had this testimonial for me, kind of an Olympic fundraiser. And my friend Charlie was there with his wife, in black tie, that sort of wear. And he came up to me and said, well, Ronnie, I’ll never forget the day you said to me that you were going to become rich and famous. He says, I want to tell you something. You became famous, but I became rich. He bought five roller rinks during the disco era and made a fortune. On smoking while he was a competitive skater: Of course Maribel [Vinson Owen, his coach] didn’t want me to smoke, and I was stupid enough to not realize that you can smell somebody, when you don’t smoke, you can smell somebody who smokes. And so consequently that never entered my mind, and I forgot one day to take my cigarettes out of my pocket. We used to wear sweaters and a shirt underneath, and I’d have the cigarettes in there and take them out and put them in my skate bag. Well, this one day I forgot. 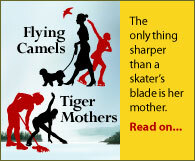 And I did a flying camel, and when I landed the cigarettes came out and flew all over the ice. And I’m picking them up off the ice and putting them back in the pack, and on the ice I can see a shadow behind me. So I just took the cigarettes and went like this, and she took them out of my hand and put them in her pocket, and skated away. Never said a word. She just continued her teaching. And that was probably about 1959 or 1958, because the plane crash [which killed the entire US figure skating team] was in ’61. And I went back to Boston to visit Grammy [Owen’s mother], and sat in the den, which was a library. And I sat with her and we were just reminiscing, talking, and I thought she was handling it very very well. And I just happened to look up on a shelf, and there were my cigarettes, on the top, just sitting there. And the thing I regret is that I didn’t take them. I knew they were mine, I looked at them, but I just left them sitting on the shelf. I should have taken them, that would have been neat. On competing in dance, singles and pairs at US championships: I don’t know how I ever did the nationals. All I remember from 1956 is sleeping, practicing, and competing. And eating. That was my entire week. I just went from one event to the other. On attending more than 40 world championships: I did 37 as a coach, and then there was my three years as a competitor. One year I had 10 skaters at worlds. It was funny, at this event there was a trivia question, and someone just handed me a card, and it was a skating thing. And it said, what coach had the most skaters at a world championship? And I said, oh, I know that answer, Carlo Fassi. And they flipped it over and it was me [laughs]. I didn’t even know. 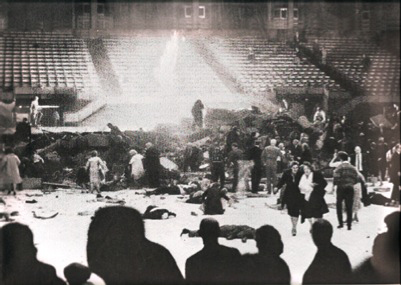 On working at a rink in Indianapolis that blew up in an explosion in 1963: There was propane stored under the seats. I think it ended up 93 were killed. 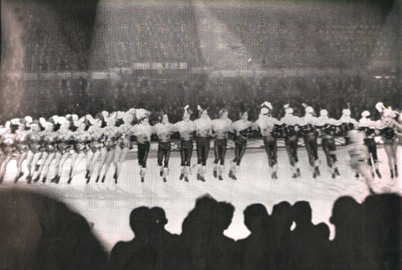 It was during a Holiday on Ice show. They were using canisters of propane, 20 or 30 of them under the seats, because they were using torches to heat the popcorn to keep it fresh. And then what happened, one of the propane tanks had a faulty valve, and it opened, and gas came out and it exploded. The guy who ran the rink had me help out in the morgue. I had to take the bodies out and if they were dismembered try to piece them together. The show minutes before the explosion . . .
. . . and after the explosion. On creating the Yankee Polka compulsory ice dance with ice dancers Judy Schwomeyer and James Sladky: I’ll tell you a funny story about that. When I skated, free skated, I used to have a choctaw and go into a double lutz from it. I used to love doing that. When I coached, I didn’t jump that much, I didn’t have time, but I could always do that. Choctaw, cross behind, cross in front, double lutz. So when I started choreographing, and Jim and Judy had a paso and I put that choctaw into the paso. So the next year it was a polka, but I loved my choctaw so we used it again [laughs]. I put it at the end of the rink, and it fit in beautifully to this one piece of music. So then we finished that year, but a few years go by and I get a call from the ISU and they say, we want your dance, we want your polka. I had made a couple of polkas, for another couple I made the Peanut Polka, which was a real simple polka. And they were looking for dances to put into competition, so I said, which one do you want? The Peanut Polka? And they said, no, we want the one with the biiiiiig choctaw. So I said, oh, you want the Yankee Polka. And so now came a problem. Because I’m saying, oh my God, that choctaw fit the phrasing of the music but not the beat. So I’m thinking, now I have to look at this and see if I can adapt it. So I just made one small adjustment. But the dance just grew over the years because the skaters got better. On coaching Kitty and Peter Carruthers: She was a dream and he was a handful [laughs]. I’d tell Peter what to do and he’d do it, but what a hassle in between. You’d give him instructions and eventually he’d get it done. But I always knew it would get done. 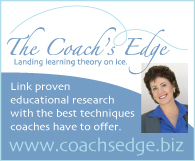 On coaching skaters at world and Olympic championships ranging in age from teens to mid-30s: When you’re dealing with the older ones you can deal a lot better with them, know what I mean? And usually it’s a little more structured. With kids, you never know what they’re going to do. College-age kids, they drive you to drink. Where’s your music? I dunno, didn’t she pick it up? Well, where did you last see it? And then we find out it was left in the music player the night before. That’s typical of what you get. So I have to keep a copy of everything. But that’s the difference in the age. On which disciplines in skating has evolved the most over his coaching career: I think basically everything has. The only thing I think is that the new [judging] system is messing it all up. They’re better skaters, but everybody’s doing the same thing. It looks like gymnastics. I don’t know about you, I love watching gymnastics, but after watching a couple of athletes, I don’t know what I’m looking at, and they’re all doing the same stuff. I’d go back to more of the old system. I like the idea of giving credit for the jumps, but you can’t give credit for footwork, no matter what they say. 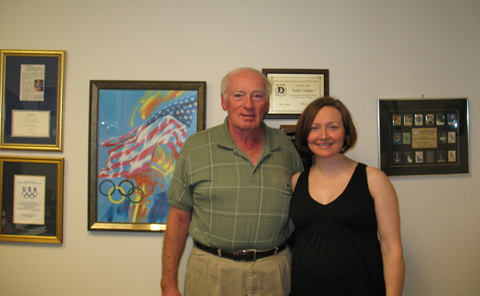 On leaving his mark on the sport: Everywhere but synchro. But I got ideas for them [laughs]. They’re doing death spirals now and I’ve got some good stuff for them.